How can i enable a default button on the wizard (Next and OK on the last page)? Users do not want to use the mouse every time to travel between input fields and the button to go to the next page of the wizard. This solution suits to Win application. 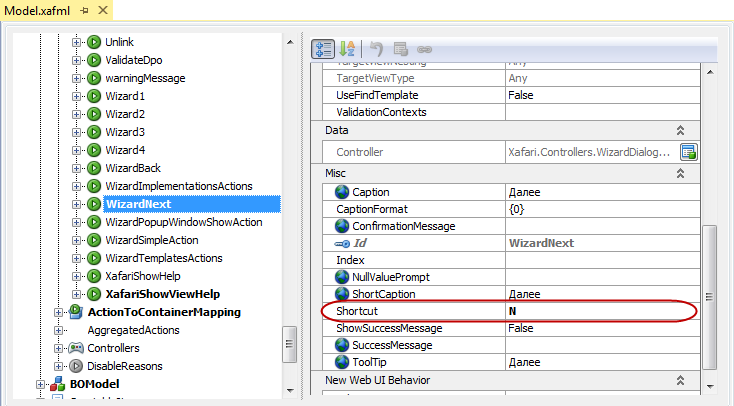 If you use a web application please give us know about it and we will try to find solution this issue and you can read ticket How do I implement a keyboard shortcuts functionality in an XAF ASP.NET applications (for example, to save detail view changes)? Note: we found an issue for complex shortcut as 'Ctrl+...', but simple shortcuts work, we are going to investigate this issue. Please let us know if you require any further information or assistance. I prefer the setting of a default button (or default action), i.e. the button that responds to pressing Enter. So, yes, i need any further assistance. How can i set the Next button as the default button? We have solution this issue using shortcut for the action as before, see attached file ActionShortcut.avi. But you can not use DetailView system buttons such as arrow. In order to fix the issue, we must first reproduce the issue in our labs. We are unable to reproduce the issue with the info you provided. Could you please provide us with a small video reproducing the problem?